A dusting of new snow. Freeze-thaw conditions (最大 3°C 月曜日の午後に, 最小 0°C 土曜日の夜に). Wind will be generally light. Mild with light rain (合計 6.0mm) 水曜日の夜に Becoming colder with a light covering of snow, mostly falling 木曜日の夜に. Freeze-thaw conditions (最大 3°C 火曜日の午後に, 最小 -7°C 金曜日の朝に). Wind will be generally light. March 30 2013. We came here with a party of 15 ranging from mid 50's to a 10 year old. Skiing and boarding experience was equally varied, from expert to first time boarder. 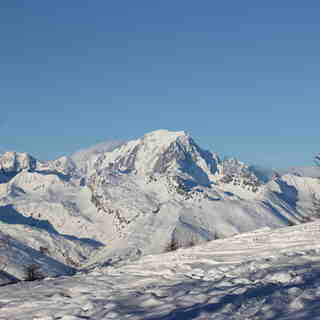 The village is a fantastic base from which to explore the whole of the paradiski. The links to Les Arc are much quicker than we had expected. The Derby chair lift is the place to aim for to get across to Les Arc as the main gondola from 1850 stops at the mid point of a run at the left of the top of Derby. The runs back to the villages of Peisey and Vallendry are all tree lined and wide, and are ideal for cruisers and beginners. ESF was fantastic. Our children had both skiing and boarding lessons and made great progress and had a nice time. They even split a class of 9 kids into 2 groups!! The village lacks character but has some nice restaurants for lunch by the main chair lifts. We stayed in a little village that was accessible by 'lobster pots' below Peissey. It was a charming village, with a few bars and restaurants. It was very English with lots of Chalets owned by British companies. The late snow and cold conditions this year made it the best Easter skiing in 20 years. 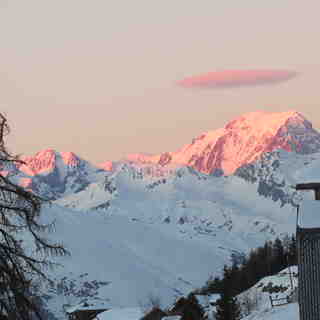 An ideal base for families but not a great deal to do once you are off the slopes.